We were significantly restricted by time. We started in the latter part of January 2017 and had a hard deadline set for the first week of May. Other than our time constraints, we were otherwise limited by our resources and person-power to complete such an extensive project. There is a spectrum of communication at a distance. Those communication mediums with low-bandwidth, such as texting or Snapchat, are used frequently but for very short periods of time, whereas those communication mediums with high-bandwidth, such a FaceTime, are used more infrequently and for longer periods of time. From our interviews with individuals in long distance relationships, we discovered breakdowns such as an inability to make eye contact with technologies like FaceTime, and having to plan ahead to communicate with such a technology doesn't allow for spontaneity. Overall, what we found from our research is that it is not simply physical contact that is missing from long distance communication. Desired activities between partners include simple things like being able to look at the person in the eye or even exercise together. From this we determined that any technology we could develop wouldn't need to be an embodiment of the partner for it to be compelling and effective. Warmth: how can heat send certain signals or messages? Pressure: what and how can pressure be used to communicate? Eye contact: how might we solve the problem of eye contact during video chat? Scent: how might we create a tool to communicate odor? Physical contact: how might we simulate physical contact such as cuddling? We decided to explore pressure and how couples could potentially use it communicate and increase intimacy. We decided to build a pair of switches that would be distributed between partners. These switches would be synchronized in state such that manipulation of the one would result in the same manipulation of the other. We iterated on this design and created a pair. One was with clear acetate and the other was with black acetate. We also changed the switch to be convex instead of concave to fit the hand more easily. The slope of each side was also made asymmetric to more effectively communicate state and provide greater affordance for pushing on it. Some couples chose to mostly use it during the day and affix the switch in their work setting, while others opted to strictly use it at night. Only one couple used the switches for more than ten minutes while the switches were in their possession. Some individuals interacted with the switch as they waited for their partner to respond while some individuals interacted with the switch long after the partner was done responding. This may have had to do with the novelty of the technology. You can see in the chart titled "All Group Uses By Time" the time of day that the couples used the devices with the y axis being indicative of the quantity of manipulation of the switch. You can see that some couples opted to have their interactions take place throughout the day while others at night. 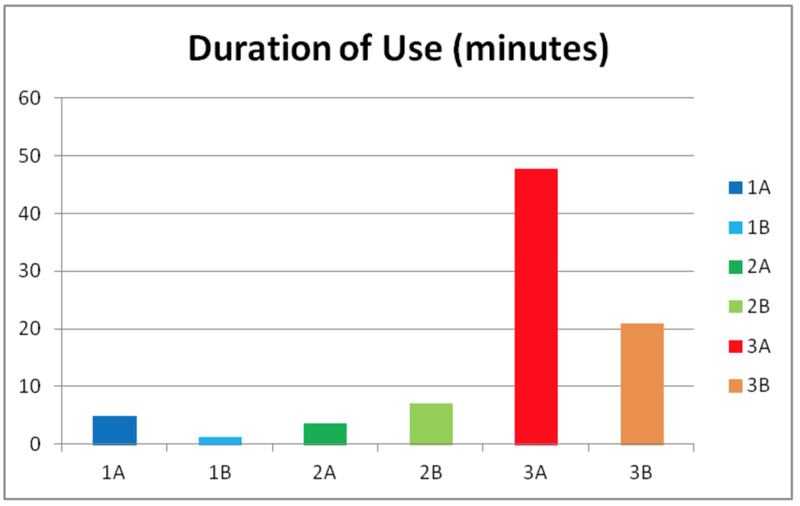 The chart titled "Duration of Use (minutes) indicates duration of usage over the time that the switches were in the possession of the couple. You can see the last couple used it quite a bit more than the others. After the couples returned the switches we were able to ask them about their experience. We found that proximity and placement of the switches impacted the usage. The switches themselves make a snapping noise when they change state, and this serves as a sort of "incoming!" message to the person with the other switch. This is not dissimilar to the vibration of a mobile phone when a text message is sent; there is an expectation of availability given this notification for most communication technologies. Users were distrusting of the switches and whether or not the interaction had been sent, which indicates that greater feedback needs to be provided when a state change for a partner's switch takes place. Many users also indicated that the switches were big and clunky (they are!). In the next iteration, we would want to make the appearance of the switches appear more organic. We would also definitely make it smaller and more mobile; we hadn't considered the extent to which people would be taking the switches with them when we built these. We also need to create a way to provide feedback to users when the message is received on the other side. We found in our testing that these switches do serve as a supplement to the communication patterns of couples, but there is much work to be done to increase usefulness and convenience. Ultimately, we want to build a tool with many actuators such that more nuanced communication could take place. We also want to find a way to communicate the extent of pressure on the switch and not just positioning. We suspect this would provide greater fidelity regarding the replication of a physical interaction with a partner.